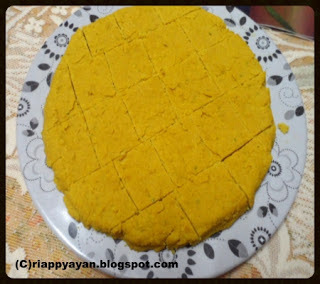 This is one of the most favorite dishes of Bengalis which is completely vegetarian that means no onion and no garlic added in making gravy or making these lentil cakes. 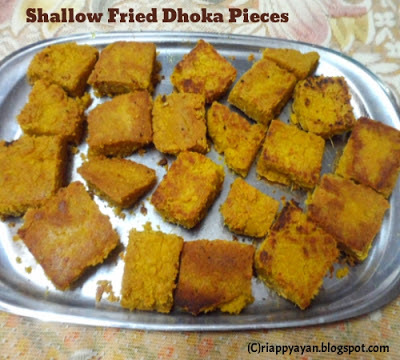 Dhoka is a shallow fried cake made from two types of lentils(dal) and then cooked in a curry with potato and very little spices, sums up Dhokar Dalna. 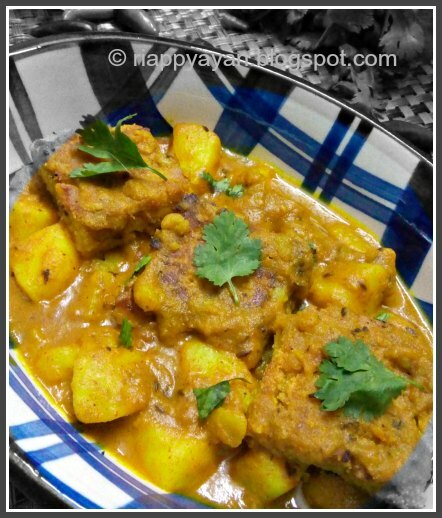 Dalna, is a cooking term that means any vegetables or eggs cooked in a medium thick gravy seasoned with ground spices, specially with Garam masala and a touch of ghee. You all must be wondering why this dish is called "Dhokar Dalna". I am not sure how this highly addictive lentil cakes got its name as Dhoka which literally means "Cheat". But I have a theory. I think, from outside you won't realize how awesome this dish tastes. When you will taste, you will be surprised, in a good way, off course. 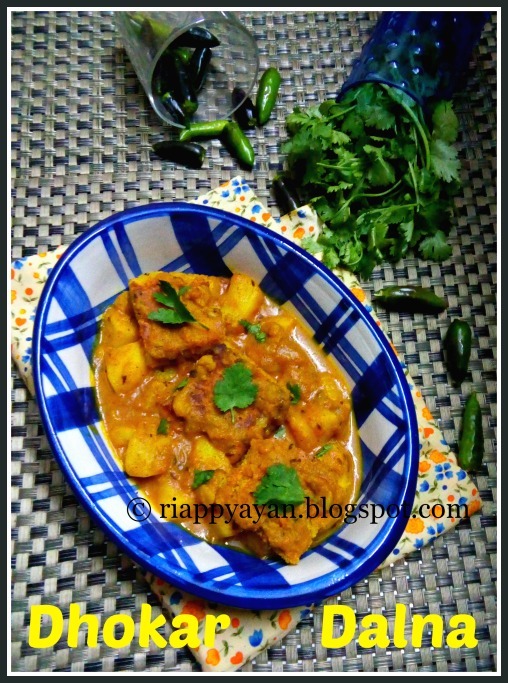 When you are bored with your regular cooking, try this dish out. It's a mouth watering dish...may be I am little overboard....bec' I love this dish. This is one of the niramish(veg.) 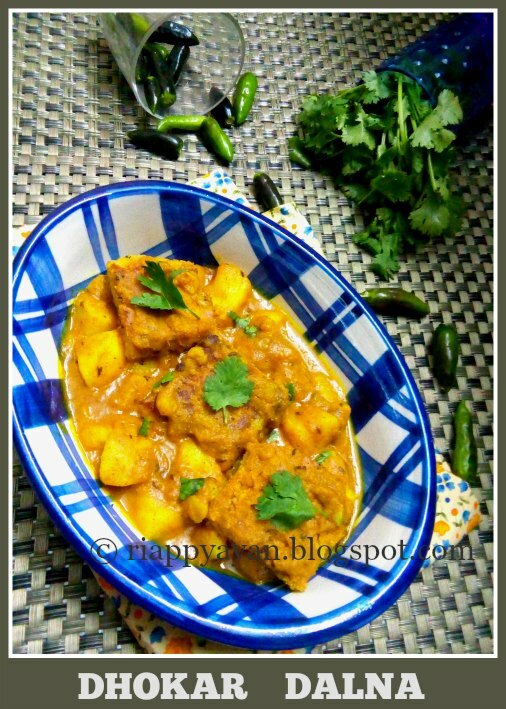 dish of bengalis. For bengalis, niramish or completely veg. means not only no meat, no fish, no egg, but also no onion and garlic. Specially, in fasting days or on some puja days, there will be no onion cooking at homes. 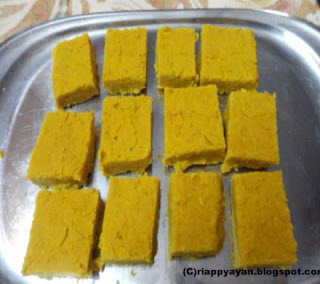 This is one of the recipe which is cooked on those puja days. In Bengali Cuisine, most of the veg. dishes are without onions and cooked with very less oil and less spices to make vegetable more nutritious. Ginger Paste : 1 tsp. Chilli powder : 2 tsp. Cumin powder : 2 tsp. Ghee/clarified butter : 1 tsp. Cumin seeds : 1/2 tsp. Garam masala : 2 tsp. Wash and soak two types of lentils overnight. Drain water and grind the lentils with 1-2 green chillies to a paste with very little water (as needed) in a mixer. In the lentil mixture, add 1 tsp. ginger paste, season with salt, little sugar, if you like add little chilli powder (optional) and roasted cumin seed powder. Mix all of them well. Now heat a pan, pour 1 tblsp. oil, pour the lentil mixture over it and in low flame stir it until all the moisture evaporates and lentil mixture looks dry and sticky but not completely dry. Grease a wide plate with little oil. Pour the lentil mixture evenly on the plate and spread it with the back of a spoon in about 1 inch high. Press lightly with your spoon so that it sets properly. Cool and cut into square or diamond shapes. These dhokas set in about 30-40 minutes. Heat 2 tblsp. of oil and fry the dhokas in medium flame to light brown on both sides. Do not over-fry them, then the curry won't go inside the dhokas and don't fry so little then dhokas will break easily in the curry. Remove and keep aside. Fry the potatoes in the same oil with little salt to light brown and keep aside. To make the gravy, heat a pan with 1 tblsp. oil, add bay leaf, cardamom, cinnamon, cloves and cumin seeds. when all the whole spices turn little brown, add rest of the ginger paste and tomatoes together. Stir till tomatoes turn soft. Potatoes will be cooked by then and gravy will be also thick after 5 minutes, now sprinkle garam masala powder and little ghee over it. Cook for another minute or two in low flame and take the pan off the heat. Dhokar dalna is ready to serve.